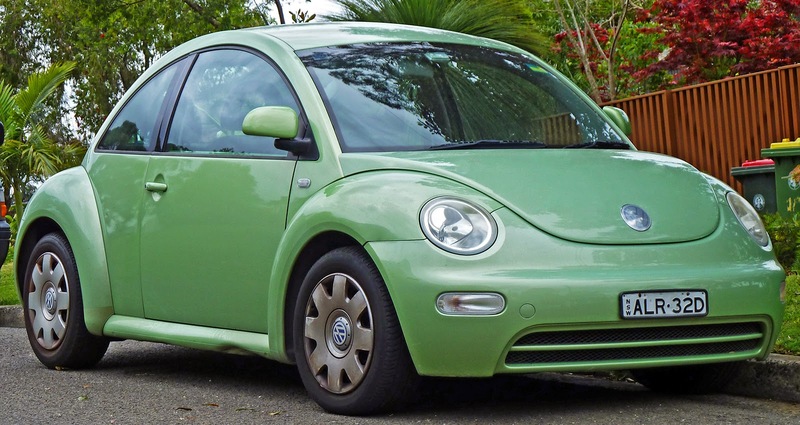 This article is about the Volkswagen New Beetle 1997-2010. For the original Beetle 1938-2003, see Volkswagen Beetle. For the 2011 car, see Volkswagen Beetle (A5). The Volkswagen New Beetle is a compact car, introduced by Volkswagen in 1997, drawing heavy inspiration from the exterior design of the original Beetle. Unlike the original Beetle, the New Beetle has its engine in the front driving the front wheels, with luggage storage in the rear. 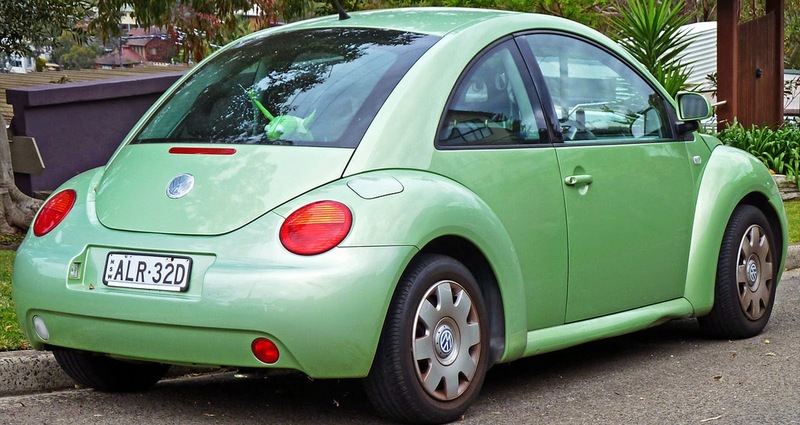 Many special editions have been released, such as the Malibu Barbie New Beetle. In May 2010, Volkswagen announced that production of the current body of the New Beetle would cease in 2011. 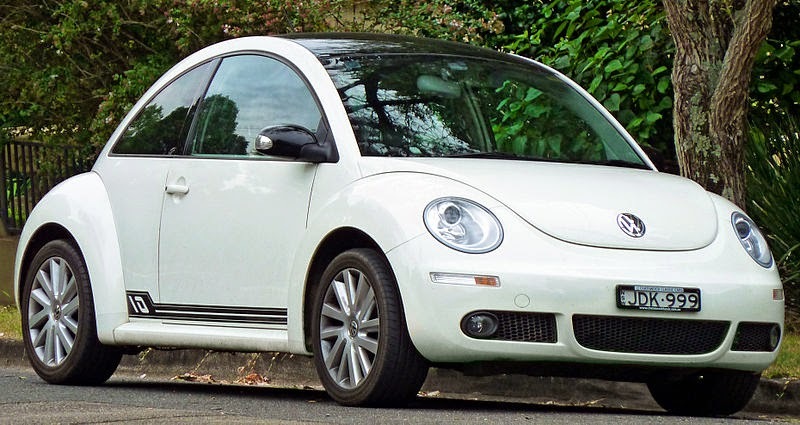 In 2011, a new model replaced the New Beetle, and the New Beetle name was changed back to the original when its successor was introduced, although the two names are often used interchangeably when referring to the New Beetle. At the 1994 North American International Auto Show, Volkswagen unveiled the Concept One, a "retro"-themed concept car with a resemblance to the original Volkswagen Beetle. Designed by J Mays and Freeman Thomas at the company's California design studio, the concept car was based on the platform of the Volkswagen Polo. A red cabriolet concept was featured at the Geneva Motor Show, also in 1994. In 1995, a new version of the Concept One was shown, in the Tokyo Motor Show. This one had major restyling and looked a lot like the final production version, launched in 1998. Strong public reaction to the Concept 1 convinced the company that it should develop a production version which was launched as the New Beetle in 1997, based on the Golf IV's larger PQ34 platform. The New Beetle is related to the original only in name and appearance (including the absence of a car emblem script with the exception of the VW logo). For the 1998 model year, only the TDI compression-ignition engine was turbocharged; the spark-ignition engines were only naturally aspirated. 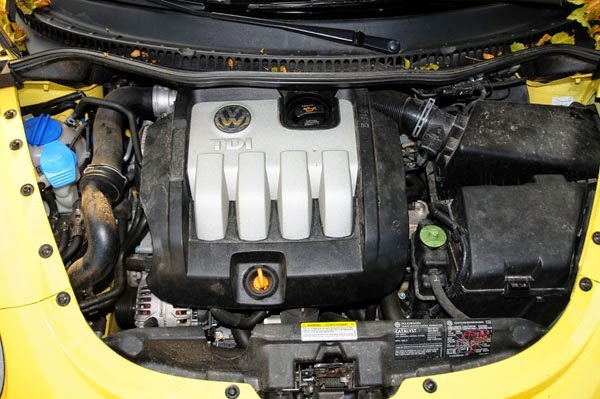 In June 1999, Volkswagen introduced the 1.8T, which was the first turbocharged spark-ignition engine offered for the New Beetle. Volkswagen created a web site dedicated specifically to the 1.8T. A convertible was added in mid year 2003 to replace the Volkswagen Cabrio. However, the New Beetle Convertible was never offered with a compression-ignition engine in North America. The New Beetle carries many design similarities with the original VW Beetle: separate wings, vestigial running boards, sloping headlamps and large round tail lights, as well as a high rounded roofline. It was assembled in VW's Puebla factory in Mexico. The car achieved five stars in the 2011 Euro NCAP tests compared to four stars in the 2000 Euro NCAP tests scoring 25 points (33 to reach five stars). The Insurance Institute for Highway Safety (IIHS) gave the New Beetle a Good overall score in their frontal crash test. 2004 models come standard with side airbags; however, the IIHS rated the BeetlePoor in their side impact test. Engine choices include the 115 hp (86 kW) 2.0 L inline-four for the base model, the 100 hp (75 kW) 1.9 L TDI turbodiesel inline-four (discontinued after the 2006 model year due to more stringent emissions requirements), and the 150 hp (112 kW) 1.8 L turbo inline-four for the Turbo and Sport models . The Turbo S model (sold 2002–2004) included the 1.8 L turbo but with 180 hp (134 kW). It also included a sport suspension, six-speed manual transmission, aluminum interior trim, revised front/rear fascias and bigger wheels and tires. A close relative of the Turbo S was the 2002–2004 Color Concept. This limited edition variant was available in limited exterior colors, with interior door panel inserts, seat inserts, floor mat piping and wheel opening inserts color-matched to the exterior paint. Wheel color inserts, diameter, and style varied with model year. It came standard with the 150 hp (110 kW) 1.8 turbo gasoline engine, 5 speed manual gear box, speed-activated rear spoiler, power windows/sunroof/door locks, heated leather seats, and fog lamps. All 1.8L Turbo and Turbo S inline-four models were equipped with a retractable rear spoiler which was not available on the 1.9 L TDI inline-4, 2.0 L inline-four and 2.5 L inline-five models. For the 2006 model, the exterior was slightly redesigned with more angular bumpers and wheel wells, and these models were fitted with the 2.5 L 5-cylinder engine with 150 hp (112 kW) which was also fitted on the Rabbit and Jetta, later becoming the sole engine option. The New Beetle would not be given the upgraded 2.5 L engine that 2008 and later Jettas and Rabbits received. It is a limited (250 units) version of New Beetle. It included a 224 PS (165 kW; 221 hp) 3.2 litre VR6 engine, a 6-speed gearbox, and Volkswagen's four-wheel drive system 4motion, Remus twin-pipe exhaust. It was rumoured Porsche tuned the suspension but this was carried out in-house at VW Individual. The suspension was greatly altered at the rear, with geometry more geared to the race track and a rear cross brace behind the rear seats, 80 mm (3.1 in) wider fenders, unique front and rear bumpers, a rear diffuser, large rear wing, and 18x9 OZ Superturismo wheels with 235/40ZR-18 tyres. Inside, it was trimmed in carbon fiber, billet aluminium, and bright orange leather. The front seats were Recaro racing buckets. Notable disadvantages found were loud cabin noise and low rear tire life. 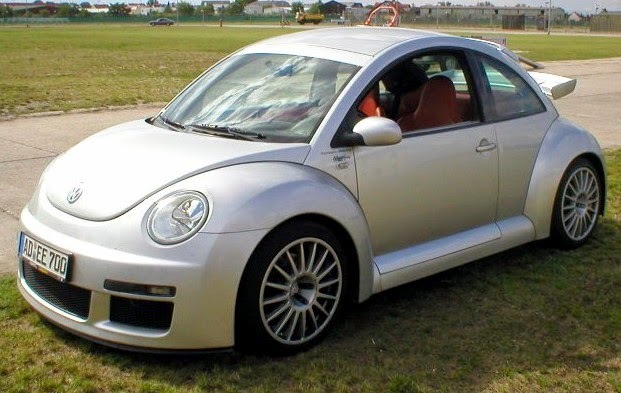 At the 2005 North American International Auto Show, the Volkswagen New Beetle Ragster concept car was introduced. It was supposed to be a preview of the future design of the New Beetle. The base of the Ragster (the name denoting a cross between a "ragtop" and a speedster) was a New Beetle Convertible modified with a new roof, giving it a much lower roofline, and a unique paint job with silver double stripes. The interior differs from the original New Beetle, being a 2+2, and having distinctive control dials The Ragster's rear-view mirror is mounted on its dashboard, a retro feature, reminiscent of the first Type 1s. 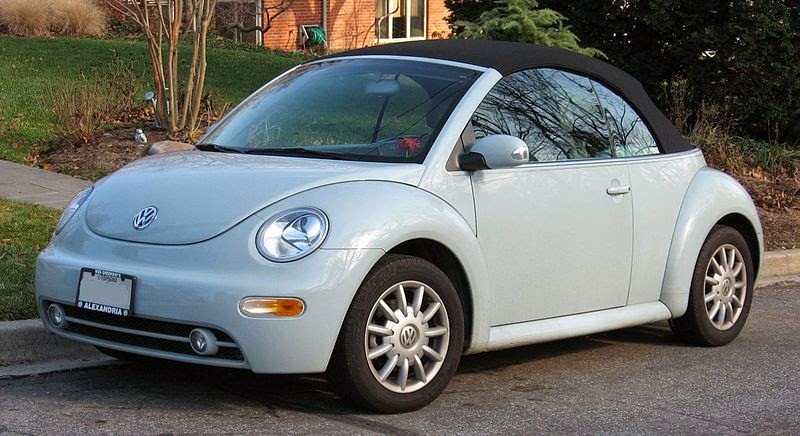 Announced at the 2009 Los Angeles Auto Show, the 2010 Final Edition New Beetle features Aquarius Blue paintwork, with the hardtop receiving a black painted roof and the convertible sporting Campanella White painted side panels. In addition to unique 17-inch wheels, both models will be powered by a 2.5 litre engine mated to a automatic "Tiptronic" transmission. Other additions include sports suspension and "Final Edition" badging inside and out. Both models arrive with integrated fog lights and Electronic Stability Programme (ESP) as standard. This edition marks the end of production of the New Beetle. The Volkswagen New Beetle was Motor Trend's "Import Car of the Year" for 1999. Last updated on 18 February 2015 at 16:30.